Out with the cool, in with the hot. These houses by such luminaries as Oscar Niemeyer, Gio Ponti, Geoffrey Bawa, and Isay Weinfeld are a perfectly seamless continuum of indoor-outdoor space. The author has traveled the globe to bring together a collection of luxurious modern homes that combine modern technology with local, often exotic materials to produce rich designs of wood, metal, stucco, and glass. Water and breezeways figure prominently, and "green" eco-conscious features emerge naturally from the tropical design environment. This is a sophisticated survey of modern houses with open floor plans, exterior courtyards, sunny patios, and cool stucco surfaces all touched by the exotic flavors of their tropical locales. The combination of modern architectural form and tropical settings is extending and revitalizing modernism as never before. Out with the cool, in with the hot. These houses by such luminaries as Oscar Niemeyer, Gio Ponti, Geoffrey Bawa, and Isay Weinfeld are a perfectly seamless continuum of indoor-outdoor space. The author has traveled the globe to bring together a collection of luxurious modern homes that combine modern technology with local, often exotic materials to produce rich designs of wood, metal, stucco, and glass. Water and breezeways figure prominently, and "green" eco-conscious features emerge naturally from the tropical design environment. This is a sophisticated survey of modern houses with open floor plans, exterior courtyards, sunny patios, and cool stucco surfaces all touched by the exotic flavors of their tropical locales. 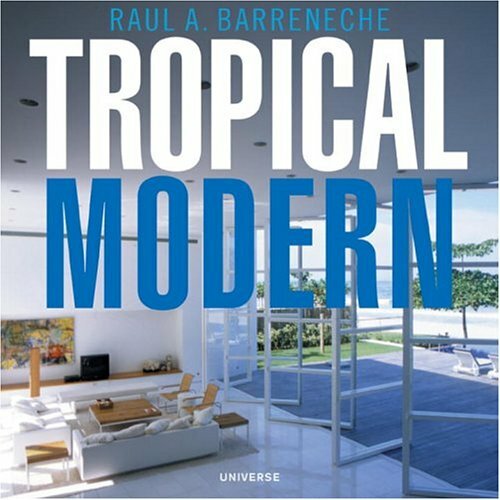 The combination of modern architectural form and tropical settings is extending and revitalizing modernism as never before. Raul A. Barreneche is a New York-based design editor and writer who has worked at Architecture magazine as a contributing editor and is the founding editor of House. He is a contributing editor to Metropolitan Home and Travel + Leisure and also writes for House Beautiful, One, Dwell, Interiors, and the New York Times.